I’m in Seattle for the BrickCon LEGO convention this weekend. It’s a really busy weekend for me, though, because I’m also here for my other hobby, dancing – I’m attending the Seattle Fusion Festival which is taking place at the same time. Luckily the dance classes are held right at Seattle Center, which is where BrickCon is, so I can bounce back and forth between the two events, as I have been doing all weekend. Actually it’s not just this weekend that was so busy – I’m at the tail end of a two-week road trip. Last weekend I was in Colorado at the Aspen Alt. 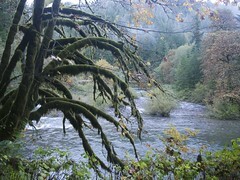 Blues Recess, another dance event, and have been exploring the western US in my van in the week in between. After BrickCon I’m heading home by way of Portland; I should be home by Wednesday. 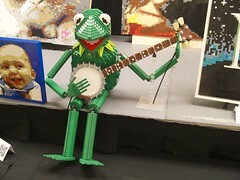 Due to the dancing I haven’t had much time to participate in BrickCon activities. I signed up for a couple of events but didn’t make the cut for most of them. I did get to participate in a relay speed build, where teams of four people took turns assembling steps in a model. Our team finished fourth I think, but there’s only a prize for the fastest team. We did get to keep the parts from the set we built, however. The set we built was Alien Conquest Tripod Invader (7051) and we divided the parts up four ways. If you’re in the Seattle area and read this in time, come on by Sunday October 7, from 9am-3pm we will be open to the public. If you missed it, it’s always the first weekend in October so add it to your calendar. 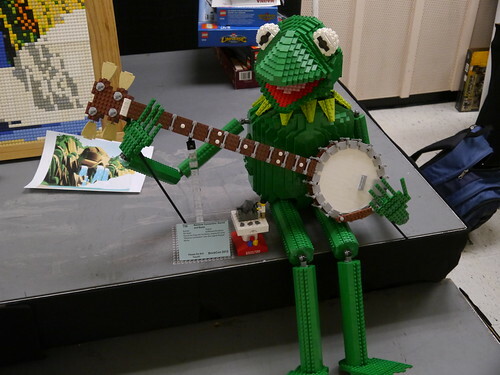 Last weekend (October 1-4) the BrickCon LEGO convention was held in Seattle, Washington. I drove up to the convention and had a wonderful time! As it turned out, my friend Donia who I met dancing in Santa Cruz was moving to Seattle that weekend, so I was able to combine helping her move with attending the convention. It also got me a place to crash so I could save the cost of a hotel room. I drove her car to Seattle, while she followed in a van she borrowed from a friend of hers. After the convention, I drove the van back home. On my way north, I stopped in Portland for the night Thursday night, and stayed at the apartment of another friend I knew from dancing. While I was there I went to the Waltz Eclectic and had a great time! In the morning I did a little Goodwill shopping and had lunch with yet another dancing friend before heading to Seattle. 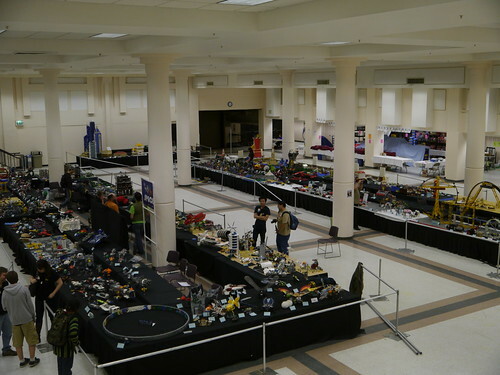 I got to the convention Friday in the early afternoon and unpacked my LEGO models. I brought the Scrambler, various cars and trucks and RV’s, a few train models, and my DC-3 airplane. The Scrambler and DC-3 were motorized, so in keeping with the theme of the event, “Bricks in Motion,” I thought it was especially important to bring those. Friday night we had the opening ceremonies, where the new 10210 Imperial Flagship was revealed. There was much oohing and aahing. Afterward we all went to the LEGO store in Bellevue where we were able to get discounted LEGO sets – 50% off “scratch & dent” sets (prize tickets were used to determine order for selecting up to 4 items) and 20% off everything in the store. It was quite crazy, as it always is at these events, but a lot of fun too. I think I restrained myself pretty well, all things considered, but I still spent a lot of money. Saturday was the first day that the exhibit was open to the public. 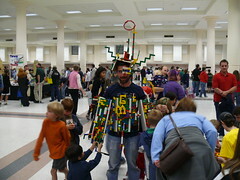 We had about 4500 people go through looking at all the LEGO models on display. Most of the day I spent with my nose in the computer, avoiding the crowds. I didn’t go around and take pictures at all Friday or Saturday, though. A few people had to leave Saturday night, so I missed a few models, but Sunday (even more people came on Sunday; over 4700!) I made up for it in terms of picture-taking. I managed to go around to all the tables and take pictures Sunday, mostly during the public hours. Also, the friends I was staying with came by Sunday and I was able to see the exhibit through their eyes which was a lot of fun. Sunday was Donia’s birthday, so we went out for sushi and chocolate. We were going to go to a swing dance featuring Gordon Webster but didn’t manage to get around to it. (But it’s OK because he played at the Friday Night Blues in San Francisco this past Friday, and I was able to go to that – the music was amazing!) But back to the BrickCon trip… On the way home I stopped in Portland for the day, and met with a colleague from Oracle who was based there. I went to Random Waltz in Portland that night (If you like dancing and ever find yourself in Portland on a Thursday or Monday night, you gotta check out those waltzes. The dance community there is very welcoming and friendly, and I had a great time at both of them! ), stayed the night in a hotel paid for by the company, and then went home the next day. I got home around 2am Wednesday morning. 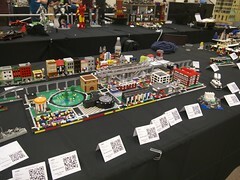 My pictures from BrickCon can be seen on Flickr (or view as slideshow). Warning: there are over 400 photos so it may take a while to see them all!